The small group meeting to pray and learn in living-rooms in the late 1970s and early 1980s couldn’t have known for certain that their community would survive to grow into a 200-family congregation, but they did know that they’d helped start something special. That much was apparent from the start. This year, Or Shalom, the outgrowth of that small group, celebrates 36 years, but will also say goodbye to its current spiritual leader, Rabbi Laura Duhan Kaplan. She and her husband, Charles Kaplan, arrived in Vancouver in 2005, encountering a vibrant and energetic Jewish Renewal congregation, with a permanent home on East 10th at Fraser Street – and an already storied history. Rabbi Daniel Siegel who co-founded Or Shalom with his wife and partner, Hanna Tiferet Siegel, was in 1974 the first person to receive smicha (rabbinic ordination) from Rabbi Zalman Schachter-Shalomi, founder of the Jewish Renewal movement. Today, Siegel is director of spiritual resources for ALEPH: Alliance for Jewish Renewal, where he also serves as associate dean of the ordination programs, chair of the rabbinic texts department and rabbinic director of ALEPH Canada. From his Gulf Island home, Siegel described the congregation’s early evolution, and what makes Renewal’s approach resonate today. About a year after arriving here, the Siegels’ vision took root. “We started the second year that we lived in Richmond, in 1978. We started what was then called the Hillel Minyan, and we would meet once a month on Friday night and the following Shabbos morning,” he said. With help from friends, the Siegels were able to put a down payment on a home on West 22nd Avenue and started leading Shabbat morning services in their living-room. The name was changed to Havurat Sim Shalom. 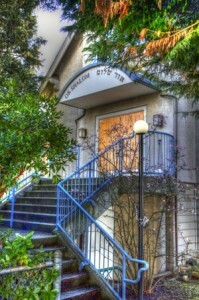 Over the next several years, services were held in participants’ living-rooms, rented homes and on the University of British Columbia campus. The Siegels worked in partnership, Daniel taking leadership of more traditional aspects, he recalled, and Hanna Tiferet on the creative expressions. In that way, there were various access points for participants. Growing up in New York, Duhan Kaplan said her “childhood experiences of Judaism were all positive: a large social circle, Orthodox synagogue, Conservative Jewish day school and Hebrew-speaking summer camp.” A self-described book addict, she graduated from university with plans to be an educator. Though the time has come to move on from synagogue leadership, Duhan Kaplan doesn’t plan to stop being a teacher. “Charles keeps reminding me to take some down time, but my normal way of living is to be working, going to school and volunteering. Next year, I’ll be working part time, teaching three graduate courses each at the ALEPH seminary and the Vancouver School of Theology. I’ll continue to take courses in Jungian psychology at Pacifica Graduate Institute and I have agreed to a big volunteer project for Ohalah: Association of Rabbis for Jewish Renewal. I hope to do some cat transportation for VOKRA, Vancouver Orphan Kitten Rescue. Yes, I’ll still be blogging! And I hope to put the finishing touches on the animal book. “Of all the roles I play, educator still resonates most deeply,” she continued. “When I’m teaching, I can be scholar, deep listener and interpersonal facilitator all at once. I have to be well prepared and flexible at the same time. And I get to play with different learning modalities, as we explore really deep ideas in ways that work for the learners. A Pittsburgh native who grew up in “a relatively non-observant, culturally Jewish-identified home,” Charles Kaplan said that he “began to rediscover and explore my Jewish (religious) roots in my 30s and this accelerated exponentially after Laura and I met.” A multi-instrumentalist, he and his wife have continued the tradition of making music a large part of the service. “Or Shalom is a wonderfully musical community and the congregational singing (without musical instruments) on Shabbos morning is utterly awe inspiring! It has been a joy to introduce new melodies to this community because they will join in with enthusiasm in singing absolutely anything, even adding beautiful harmonies,” he said. Or Shalom’s 36th anniversary celebration features entertainment by Tzimmes and Grand Trine, on March 1, 7:30 p.m., at VanDusen Botanical Garden. Tickets at 604-872-1614 or [email protected].